to clarify the withdrawal agreement. extension of one or two years after the end of 2020). comments in that blog post. here the basics of the two systems for the benefit of non-specialists. case on whether the Article 50 notification can be reversed, discussed here. determining an infringement of EU law). US government’s objections to aspects of the WTO’s functioning). Member exports a lot of to the losing Member). they are equivalent to its losses due to the losing Member’s breach of WTO law. ruling or not, in practice that dispute can go to arbitration as well. Ireland in particular, until replaced by another treaty. afterward, it only has to take “due regard” of them. During the transition period, the Court’s normal rules apply to the UK. place before the end of the transition period. competition law which apply to the Irish border “backstop”. and (c) a possible role in the arbitration process. been executed already by the end of the transition period). offer to compensate any of their fellow citizens who suffer as a result? for direct effect under Union law. incompatible domestic provisions, through domestic primary legislation. before the end of the transition period. of the European Union handed down after the end of the transition period. end of 2020, unless extended. and 6 define “Union law” for the purposes of the agreement). to the agreement itself and to EU law made applicable by the agreement. “Union law” for the purposes of the agreement). refers to: the agreement, rather than the EU law referred to in it. bases in Cyprus, discussed further below. Court where the case is referred back to the General Court. Justice or the General Court, as the case may be. infringement actions against the UK and annulment actions brought by the UK. Justice of the European Union shall have jurisdiction over such cases. Union shall have jurisdiction over such cases. respect of the United Kingdom as in respect of any Member State. four-year time limit from the end of the transition period to bring such cases. proceedings. This limit is a victory for the UK. preliminary ruling after that point. This prospect has disappeared entirely. shall have binding force in their entirety on and in the United Kingdom. in paragraph 1 of this Article. judgments – to the extent it has jurisdiction – are always binding. finding that they have infringed EU law. ruling by a court or tribunal of a Member State. referred to in Article 95(3). European Union in the cases referred to in Article 87 and Article 95(3). or assisting a party before the Court of Justice of the European Union. shall be binding on and in the United Kingdom. Court of Justice of the European Union in accordance with Article 263 TFEU. legal persons residing or established in the United Kingdom. action jurisdiction in Article 263 TFEU. that power to the relevant UK agency. efraif there are legal challenges under Article 95(3). provided for in the Treaties. of Justice of the European Union to give a preliminary ruling on that question. years from the date from which Article 19 applies. rulings given pursuant to Article 267 TFEU in the Union and its Member States. only apply from the end of the transition period (see Article 185). infringement proceedings) will not apply. the text of Article 158, but not Articles 159 to 163.
rule) on such cases at that point. (Compare with Article 86, discussed above). application of Part Two in the Union and in the United Kingdom, respectively. Kingdom may abolish the Authority. to make its own binding decisions on complaints brought to it. bring proceedings as regards general changes to the law, or to comment on them. choose to set an Authority up unilaterally. understood as including the United Kingdom. (Part Three) was dropped from this Article. already, this jurisdiction will become less relevant over time. notified to the United Kingdom. Article 158 of this Agreement. UK lawyers a right of audience in relevant cases. or intervene in UK courts as regards State aids. the highest courts of the Member States. or the specific parts of the agreement. that might affect its operation. enters into force, with no time limit on its application. written notice to the Joint Committee. Title shall be made within the Joint Committee. discussions in the Joint Committee, with a view to reaching a political settlement. be exercising as regards dispute settlement, however. time limit on their application. party and to the International Bureau of the Permanent Court of Arbitration. requested before the expiry of the time limit laid down in paragraph 1.
same time limits applied, but the CJEU would have had jurisdiction, not arbitrators. ownership rules in Article 25 of the Annex. this Article will not be submitted for any legal drafting awards. list complies with these requirements at any moment in time. government of a Member State, or of the government of the United Kingdom. accordance with paragraphs 5 and 6.
the United Kingdom to act as chairperson. entitled to be present at the selection. Court of Arbitration shall be appointed. this Article to constitute the arbitration panel. are five arbitrators instead of the usual three WTO panellists. and may amend the Rules of Procedure. the United Kingdom within 6 months from the date of its establishment. no absolute deadline if the arbitrators fail to meet it. case is referred to the CJEU. which shall be binding on the arbitration panel. the request referred to in the first subparagraph after having heard the parties. organised within 15 days of the request for the parties to be heard on the matter. The arbitration panel shall provide reasons for its assessment. on which the Court of Justice of the European Union has given its ruling. EU association agreements have never been used to date. days at least to consider the impact of the Court’s ruling. 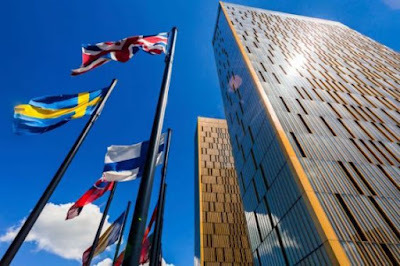 lawyers, will apply to references to the CJEU from the arbitrators. comply with the ruling in accordance with the procedure in Article 176.
rules than they do with ordinary EU law. for compliance (the “reasonable period of time”). the reasonable period of time. may be extended by mutual agreement of the Union and the United Kingdom. for more detailed review of compliance with a DSU ruling. that it has taken to comply with the arbitration panel ruling. United Kingdom within 90 days of the date of submission of the request. shall be 60 days from the date of establishment of the new arbitration panel. referred to in this Agreement, Article 174 shall apply mutatis mutandis. regime). Note the possible need to ask the CJEU about EU law issues again. unless the respondent has requested arbitration under paragraph 3.
complainant before the expiry of the 10-day period referred to in paragraph 2.
any suspension shall be consistent with the arbitration panel ruling. with the Court applying a fine if the argument was upheld. if that treaty provides for it. Retaliation also has to be proportionate. Compare to Article 22(3) to (6) of the WTO dispute settlement rules. to be involved in interpreting. Article 22(8), first sentence, of the WTO dispute settlement rules. within 75 days of the date of submission of the request. end of the 45-day period. case be 90 days from the date of establishment of the new arbitration panel. on interpretation of EU law. arbitration panel shall be published. rules. The obligation to publish decisions (also WTO practice) is useful. amend that Code of Conduct. by them in the exercise of their functions on that arbitration panel. and in the United Kingdom in respect of Northern Ireland. proposal from the Specialised Committee. which they produce within the Union and its Member States. represent or assist a party in relation to such administrative procedures. a party before the Court of Justice of the European Union. respect of measures of the Member States”. relevant case law of the Court of Justice of the European Union. Protocol. Article 1 itself applies from the end of the transition period. as provided for in the Treaties in this respect. as those which they produce within the Union and its Member States. it applies to the whole protocol, not selected parts of it.